Hodor is not man of many words. In fact, he’s just got one: “Hodor.” And while communication may not be his forte, one wonders how his adventures with Brandon Stark might have turned out if they had the mobile communication technology we all take for granted today. Thanks to the recent release of TwiML Bins we don’t have to wonder any longer. 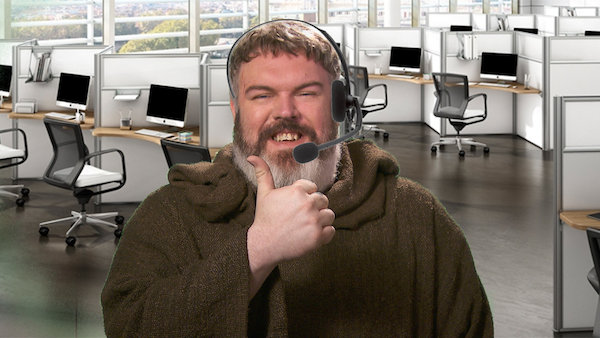 To get in contact with Hodor, you need only call or text our Hodor Hotline at (917) 722-6264. Ask him anything you like, and digest the wisdom of his reply. TwiML is a simple set of instructions used to program your Twilio number. TwiML Bins let you host static TwiML without setting up a server of your own. We’ll create two TwiML Bins – one for the instructions on what to do when a text message comes in, and one for phone calls. Go to your Twilio Console. Scroll down and click Developer Center. Click Create a New TwiML Bin. Name your TwiML Bin “Hodor SMS”. Now create a second TwiML Bin and name it “Hodor Voice.” Here we’ll <Play> a WAV file that’s hosted on Dropbox (of course, you can swap in the URL of any publicly accessible MP3 or WAV if you’d like). Paste this code in, then save your TwiML Bin. Congrats! You just wrote some TwiML. Now you just need a phone number. Go to your Twilio Phone Numbers. Click Buy a Phone Number. Search for a number that suits you. Confirm your purchase and click Setup Number. Now we need to tell Twilio where to find instructions on what to do when someone calls or texts this number. Under Voice, look for the line that says “A call comes in.” Change the first box to “TwiML” and the second to “Hodor Voice”. Ensure your settings look like this, then hit Save. That’s it! Text your shiny new Twilio phone number. Then, give it a call. If you build something cool with TwiML Bins, hit us up at @twilio. And if you have any questions, drop me a line at @greggyb or gb@twilio.com.